gears rather than cams and, thanks to a strip-spring that has replaced the classical balance-spring system, return to their initial positions after “passing on the baton” to the next retrograde hand. This innovation facilitates adjustment and enhances shock resistance. The Dubois have been watchmakers for four generations. As well as trailblazers. Between Marcel Dépraz, son Roger, son-in-law Reynold Dubois, grandson Gérald Dubois, and great-grandsons Pierre, Pascal and Jean-Philippe (present directors of Dubois Dépraz), almost 50 patents have been registered in a century. And it is with his two brothers that Pierre Dubois, CEO of PIERRE DEROCHE, has developed the TNT Royal Rétro. The idea was born during one of those numerous and passionate discussions held around the family table: if today’s timepieces offer a triple retrograde reading of the seconds, why not go further and offer six retrograde hands? This required a movement that could house six mechanisms, remain unaffected by their velocity, and avoid any untimely stoppages. 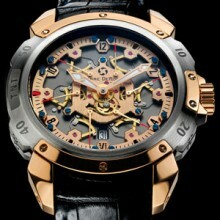 A feat that PIERRE DEROCHE has successfully achieved with the TNT Royal Rétro, which is to be unveiled at Baselworld 2009 ! AN EXCEPTIONAL MOVEMENT IN AN EXCEPTIONAL CASE ! While more than a year of tests was required to guarantee the technical excellence and reliability of the movement, the design also received considerable attention. One is immediately struck by the powerful character of the case. Designed in several parts in a highly successful combination of different materials – titanium middle, steel bezel, and pink gold horns, crown-shield and crown - its construction highlights all PIERRE DEROCHE’S expertise. Limited to 21 pieces. While there is nothing new about retrograde displays of the date, day and hours, the spectacle of six moving retrograde seconds hands is truly innovative! Thanks to PIERRE DEROCHE! While this feature has been introduced to provide an element of fun, it also reveals a totally original approach: all the retrograde hands in this model are driven by gears rather than cams and, thanks to a strip-spring that has replaced the classical balance-spring system, return to their initial positions after “passing on the baton” to the next retrograde hand. This innovation facilitates adjustment and improves shock resistance. 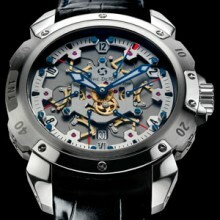 The seconds are displayed by a relay team of six retrograde hands around the dial. The sector with the moving hand is indicated when the window in the middle of its bridge turns red. When this hand completes its 10-second cycle, it “passes on the baton” to the following sector and returns to its initial position. The “baton” is thus passed on from one sector to another ad infinitum. Not content with replacing cams with gears and balance-springs with strip springs, which improves both the design and shock resistance while reducing the risks of wear and tear, PIERRE DEROCHE has introduced another technical achievement: a single central bridge for 12 pivots. The multiplication of hands increases the need for more energy. This is supplied by the meticulously-designed extra-large 22K pink gold oscillating weight, which is pierced, engraved and coloured. The ultimate touch of perfection is the cover stamped with the PIERRE DEROCHE seal. in gold (18 K). Moving retrograde hand indicators. Minute wheel with Pierre DeRoche logo. Hand affixed by a transversal pin. 6 retrograde seconds hands on gears; strip-spring return. Date at 6 o’clock. Black PVD titanium middle, steel bezel, 18 K pink gold horns, crown-shield and crown, 47.5 mm in diameter. Hours, minutes, retrograde seconds in six 10-second sectors, date. Crocodile with 18 K pink gold safety folding clasp. Series of 21 for the version with pink gold. 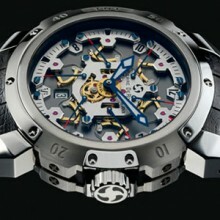 Titanium and steel case in a limited edition of 201 pieces.